In the last post, we focused on the Douglas Fir, and today it’s all about the Fraser Fir, another hugely popular and classic Christmas tree. As part of the fir family, it is also referred to as the Southern Balsam or the Southern Balsam Fir (as well as being misspelled as Frasier, Frazer, or Frazier). One if its more interesting names is “She Balsam,” named due to the resin-filled blisters on the tree’s trunk that you could “milk” for resin. The Fraser Fir was named for John Fraser (1750-1811), a Scottish botanist that explored the southern Appalachian Mountains and made many collections from there. The trees can reach up to 80 feet in height, and 1 to 1 ½ feet in diameter. Fraser Firs are monecious, meaning that both the male and female flowers (strobili) grow on the same tree. Fraser Firs are wind pollinated with cones maturing in a single season. The cones are on average 2-2 ½ inches long with bracts that are longer than the scales and appear to be bent over. These visible cone bracts help distinguish the Fraser Fir from the Balsam Fir. The bark is a greyish brown color, thin, and smooth. Young Fraser Fir trees have lots of resin blisters, and older trees have a bark similar to thin, papery scales. Fraser firs grow best on fertile, rocky to sandy soils which are acidic and can only grow at elevations 4,500 feet. Growth is limited to the southern Appalachian Mountains in Southwest Virginia, West North Carolina, and East Tennessee. North Carolina produces the majority of Fraser fir trees. The highest native habitat is in Mt. Mitchell, NC with an elevation of 6,684 feet and which is the highest point in the United States east of the Mississippi. North Carolina currently has approximately 50 million Fraser Fir trees growing. 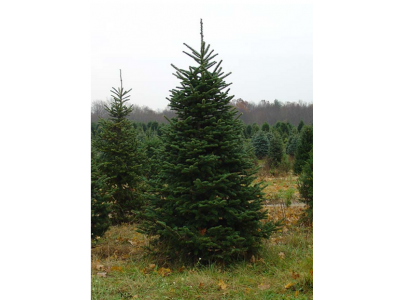 It takes 7-10 years for a Fraser Fir to grow to a 6-7 foot tree. The Fraser Fir’s wood is soft and brittle, best for pulpwood, light frame construction, interior knotty paneling, and crates. These trees have been shipped everywhere in the US as well as to the Caribbean Islands, Mexico, Canada, Bermuda, and Japan. In addition to offering the Fraser Fir Christmas tree, Christmas Farms also offers free shipping delivery of fresh greens, wreaths, swags, and garlands made with the branches and needles of the Fraser Fir. You pick your delivery date.